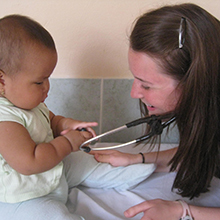 For over 23 years, the Office of International Medicine Programs (IMP) at the GW School of Medicine and Health Sciences (SMHS) has cultivated global partnerships to create transformational mutual exchange in medical education, training, and research. IMP’s goal is to provide life-changing opportunities to build the capacity of other countries and share the latest advances in medicine and healthcare. As a pioneer in international medical education, training, and research, IMP has developed, coordinated, and completed over 150 projects in over 50 countries, touching the lives of more than 12,000 healthcare professionals, students, and patients around the globe. From medical or surgical missions in Haiti to medical research fellowships right here in the nation's capital, the options for experiential medical exchanges are abundant. If you are interested in undergraduate, graduate, and post-doctoral programs, explore our Programs page. Needs-assessment at a hospital in Nanjing, China and extensive consultation at preeminent medical centers in Saudi Arabia are just two examples of the many customized projects we have developed for our partners. If you are interested in our capabilities for consultation of governments, medical schools, hospitals, clinics and independent organizations, explore our Partnering with IMP page.